I love pancakes, crepes, thick buttery Bulgarian katmi, but making them always turns into a nervous nightmare. I can’t even be around in the kitchen when somebody else is flipping the batter. I have fought this curious malady, but so far with no success, and so I was happy to surrender to my husband’s willingness to take over this part of our diet. Over the years we spent in Poland with no commercial pancake mixes he developed a recipe that makes great fluffy cakes, which we devour at least twice a month. 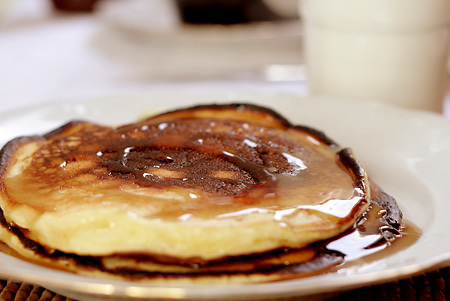 Some of our American friends were shocked to find out that pancakes could be made without any help from Aunt Jemima. Even now in the States he uses this simple recipe much to my delight. The greatness of pancakes is that they are the base for so many yummy condiments. I usually eat them savory with feta or goat cheese, sun dried tomatoes, baby green salad, but the rest of my family is more orthodox and goes for good quality jam or maple syrup. Even if you are a pancake mix devotee, try this courtesy of my other half and you’ll see how easy it’s to make them by yourself. Our kids love to help during the process, something we are happy to oblige. Sift together the flour and baking powder. Add the salt and sugar, then the eggs and buttermilk. Mix lightly until large lumps disappear, but don’t overmix if you’re not a fan of flat, rubbery cakes. The batter should be of a thick but flowing consistency – add a bit of water if it becomes too thick. Fry over a medium flame until golden on both sides. Serve with maple syrup, or whatever you have at hand – I’ve seen good use made of all kinds of jams and preserves, but also of goat cheese and pickled onions, not to mention a variety of cured meats. This entry was posted on Tuesday, March 3rd, 2009 at 8:00 am	and is filed under Breakfast, Desserts, Kids, Recipes. You can follow any responses to this entry through the RSS 2.0 feed. You can leave a response, or trackback from your own site.